The De Soto Fire & Rescue Department is dedicated to providing care during the event of a fire or medical emergency. The De Soto Fire & Rescue Department provides Fire and EMS protection for an area of approximately 20 square miles. They respond to an average of 150 calls a year with 2 engines, 2 brush trucks, 1 water tender and 1 light rescue vehicle. Medical calls are handled by Dallas County EMS with the assistance of the De Soto Fire & Rescue Department. The mission of the De Soto Fire & Rescue Department is to minimize the loss of life and property threatened by the hazards of fire, medical, and other emergencies. We accomplish this mission daily by providing the highest quality fire protection, emergency medical care and community education possible. 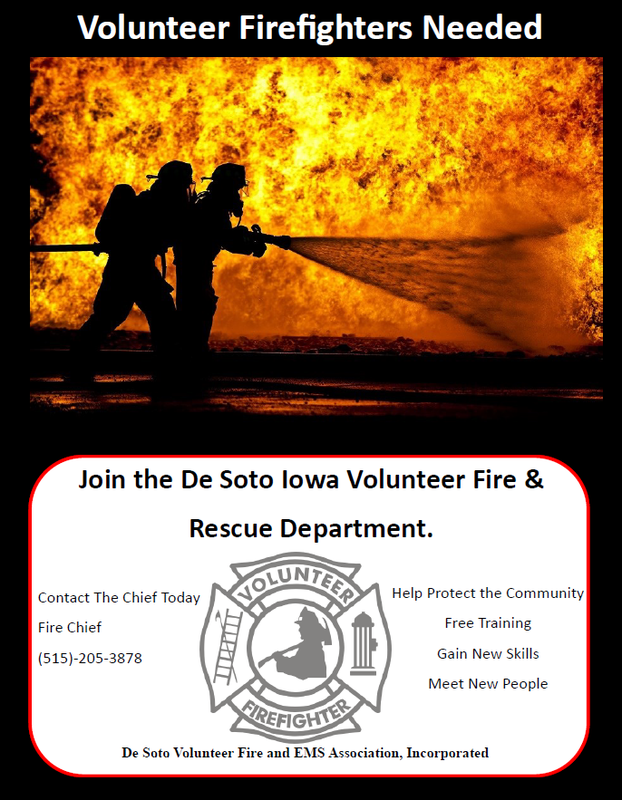 The De Soto Fire & Rescue is always looking for volunteers that wish to give back to their community. If you are interested in joining please contact city hall. Training and gear is provided at no cost to you. Please note that all burns need to be called into Dallas County Dispatch at 515-993-4567 before beginning, and after the end of the burn session. This also includes small scale “Backyard” fire pits.